Welcome to the KZNCC newsletter! In this issue we look at our outreach to KZNCC members and heads of churches to keep members updated and seek ways to improve ecumenical relationships and strengthen churches’ roles in ecumenical activism. We also share news from our sister ecumenical organisations in KZN and important information on the Parliamentary Portfolio meetings as a way of preparing church leaders and civil society to participate in engaging policy makers. For details on how you can participate please contact Dr Lucas Ngoetjana on 033-3454819 or lngoetjana@kzncc.org.za . Thank you for your support and as always we look forward to your comments, suggestions, and input. As a way of revitalising ecumenical relations, we are meeting with heads of churches to encourage meetings of senior clergy and heads of churches in each of the five KZN regions. The first series of meetings took place in the Thukela-Mzinyathi Amajuba region. Bishop Tsietsi Seleoane very much welcomed this idea and will be hosting the first ecumenical meeting of church leaders in the Thukela-Amajuba-Mzinyathi region at his church in Ladysmith in July. Furthermore, Bishop Tsietsi offered TAMCC and KZNCC free use of the church hall so that we no longer have to use hotels and motels but church premises for ecumenical events. We are very grateful for this support. Bishop Sandy Dickie encouraged the KZNCC and TAMCC to organise ecumenical meetings for senior church leaders in the North Interior of KZN to discuss ecumenical relations and their involvement in social, political, and economic issues. Bishop Sandy Dickie of the Methodist church meets with Dr Paddy Kearney, KZNCC consultant, and Rev. Muzi Dumakude, Director of the Thukela-Mzinyathi-Amajuba Christian Council to discuss ecumenical relations. Rev. Mvume Dandala recently met with KZNCC and Midlands Council of Churches’ staff to discuss issues of ecumenical development and mutual support. From the Seth Mokotimi Theological Seminary, we are currently hosting Mr Mohlatse and Mr Masentse as interns learning about administration and filing, project managemen,t and proposal writing. New exciting ideas discussed include exploring possibilities of KZNCC and Seth Mokotimi jointly hosting two theological symposia each year, students from the seminary being involved in the KZNCC’s Male Caregivers’ Programme, KZNCC being invited to make special input during certain lectures, for example on ecumenical social activism, active citizenship participation, and development of “Theologies of the Church as a caring community”. Rev. Mvume Dandala meets with KZNCC and the Midlands Council of Churches’ staff to discuss issues of ecumenical development and mutual support. From left, Ms Hilary Taylor (SMS), Dr Mvume Dandala (SMS), Dr Lukas Ngoetjana (KZNCC) and Ms Makhosi Zondi (MCC). Hosting the meeting, Bishop Graham Rose welcomed the idea of holding regular meetings for senior church leaders in the Thukela-Amajuba-Mzinyathi Region. As a contribution to the ecumenical movement, Bishop Graham offered the use of Pax Christi Conference facilities to TAMCC and KZNCC for use at highly subsidised cost. We deeply appreciate this gesture in the light of financial constraints currently facing faith-based NGOs working on development issues. From left: Rev. Muzi Dumakude, Bishop Graham Rose, Bishop Steven Zulu, Mr Paddy Kearney and Bishop Twala. KZNCC and the uMgungundlovu District Municipality are partners in the HIV and Aids Prevention programme, as well as supporting churches on skills development so that communities can use their land and human resources for food security. This strategic networking and partnership between churches and municipalities appears to be an important and significant link between municipalities and the churches. With this kind of practical collaboration, communities may start to develop trust in the work of municipalities. KZNCC is monitoring this pilot model and with its success, will explore how this work could be replicated in other districts. Mayor of uMgundlovu District Municipality (behind wheel-barrow) handing over gardening tools to the Theology Students at the Lutheran Theological Institute (LTI). The gardening tools will be used to train clergy on food production and to support green vegetable production so that after graduation, students can replicate this work in their churches and communities. Many farms are faced with continuing strikes by farm workers demanding that farmers pay the government stipulated minimum wage of R105 per worker per day. Concerned about this widespread situation, the KZNCC Land Issues Steering Committee has been closely monitoring reports on strikes on KZN farms. Now, with more farm worker strikes looming and with farmers retrenching workers, the farm situation is unstable. In fact, it threatens to be violent and spell disaster for food security. The KZN Land Steering Committee composed of church leaders, farmers, and landless people has recommended Rev. Zipho Ntuli ( KZNCC Land Issues Provincial Co-ordinator ), Mr Gcino Shabalala ( Landless People’s Movement ) and Rev. S. Scott, ( member of the KZN Farmers’ Union ) to continue assessing the situation on Hilton, Greytown , Seven Oaks and Boston farms and advise church leaders seeking solutions to the farm conflicts. briefing on land policies on land, as well as on the rights of farmers , farm workers, farm dwellers, and tenants. visibility and active support of negotiations to resolve conflict on farms. So far, through their interventions, the farm workers in Hilton have had most of their grievances addressed and their living conditions improved drastically, with the farmer improving the housing, water supply and medical facilities for the workers. Discussions are on-going. The Collaborative for HIV and AIDS, Religion and Theology ( CHART ), based in the School of Religion, Philosophy and Classics at the University of KwaZulu-Natal has been engaged in research on the interface of religion and HIV for the past four years. An international research project titled, “The Cartography of HIV and AIDS, Religion and Theology” has resulted in two key resources: the first an annotated bibliographic database of over 2500 entries on Religion and HIV, which is available online on the CHART website www.chart.ukzn.ac.za ; the second the publication, Religion and HIV: Charting the Terrain which won the 2010/2011 UKZN Book Prize in the edited book category. 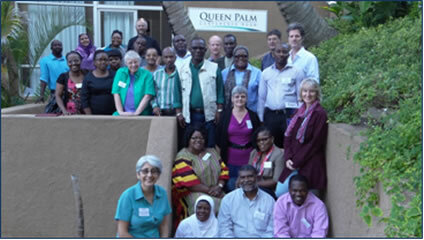 CHART organised a consultation, “Contending with HIV, Contending with the Church: Building a Redemptive Religious Community,” which took place from 6th – 9th May at the Salt Rock Hotel, north of Durban. This consultation brought together Muslim and Christian leaders from South Africa, Zimbabwe, Zambia, Rwanda, Kenya and Namibia where the findings of the “Cartography “project were shared and a way forward for the future work of CHART mapped out. KZNCC has been approached by several schools to intervene on the alleged Satanism activities in schools. Whilst some church leaders are restless and can’t wait to go and exorcise the demons; to this call, KZNCC has responded with caution to this and invited church leaders, the Departments of Social Development and of Education and the Premier’s Office to a meeting to deliberate on this phenomenon and to adopt an integrated approach. Like the Gauteng Council of Churches in Johannesburg, a planning team composed of these four sectors will draw up a memorandum of understanding of what will happen in schools, develop a database of carefully-chosen clergy to be commissioned to visit the schools, conduct briefing and debriefing sessions before the teams go to troubled schools, draw up guidelines so that the commissioned people act strictly within the laws of the country, and other guidelines outlining the processes to respond to school invitations to deal with this issue ( should you be interested to participate in this please contact Rev Simpiwe Manqokontsi on 033-3454819 ). Professional Training is offered by the Dutch Reformed Church. The NeGeMaDi Training is a joint initiative of the KZN Christian Social Services and NG Social Services in the Free State. This centre offers training for Social Auxiliary Workers. This training programme can be completed in a single year of instruction and practical experience. At the end of the programme, trainees will receive an FET Level 4 Certificate in Social Auxiliary Work. Midlands Council of Churches’ (MCC) Chairperson Rev. Albert Chetty has ensured that the MCC is a registered entity with a good constitution and that careful processes are taken to recruit good leaders that will ensure good governance of MCC. Mr Paddy Kearney’s baseline study showed that MCC needs to improve on the aspect of making sure that it is diverse and representative of the spectrum that characterises Christianity: Evangelicals, mainline churches, African Independent Churches, Charismatic and Pentecostal churches. We are happy to share that various strategic partnerships have been pursued including networking with PACSA, Sinomlando and the Tearfund. (For more information, please contact Rev. Simpiwe Manqokontsi on 033-3454819 or at mcc@kzncc.org.za ). In this newsletter we choose to share with you the success of our work on focussing on the protection of children. TAMCC has been working on supporting orphans and vulnerable children. This is in view of the problem of human trafficking, teenage pregnancies, street kids, child-headed homes, and child prostitution. Several presentations have been done to address this challenge in the Thukela-Amajuba-Mzinyathi region. With the help of German partners, TAMCC has successfully built four fully-functional crèches in township communities. These serve to make sure that orphans and vulnerable children are well fed, spend their days in safe and secure environments, and that they grow being well looked after emotionally, psychologically, and physically ( For more information please contact Rev Muzi Dumakude on muzidumakude@yahoo.com ). This Provincial Ecumenical Assembly will draw together Churches, Ecumenical organizations and individuals to jointly look at the present challenges and deliberate on how to contribute solutions. We are very happy to introduce Jabu Sibeko to you and trust that our working relations will develop as she supports ecumenical growth. Ms Jabu Sibeko joins the KZNCC as receptionist. She is a strong Christian and has a good ecumenical background and a strong commitment to social justice and poverty eradication. Vision Excellence, Jabu’s former employer describes her as honest and hardworking, a good listener and fast learner who is punctual and meets set deadlines. We wish her a long, prosperous service with the KZNCC family, and kindly request you to offer her your support as she will be the front face of KZNCC, liaising with you and your institution (Jabu very much looks forward to hear from you on 033-3454819 or info@kzncc.org.za .